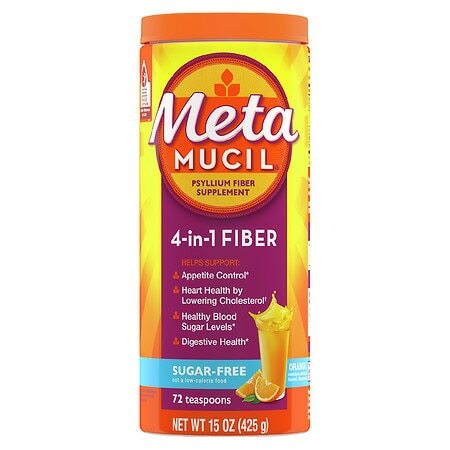 Metamucil Smooth Texture Sugar-Free Orange Fiber Laxative: For Cholesterol Lowering and Heart Health. Diets low in saturated fat and cholesterol that include 7 grams of soluble fiber per day from psyllium husk, as in Metamucil, may reduce the risk of heart disease by lowering cholesterol. One adult dose of Metamucil has 2. Metamucil Smooth Sugar Free Powder 72 Teaspoons Orange - 15 oz.